AS DONALD TRUMP prepares to welcome Xi Jinping next week for the two men’s first face-to-face encounter, both countries are reassessing their place in the world. They are looking in opposite directions: America away from shouldering global responsibilities, China towards it. And they are reappraising their positions in very different ways. Hare-like, the Trump administration is dashing from one policy to the next, sometimes contradicting itself and willing to box any rival it sees. 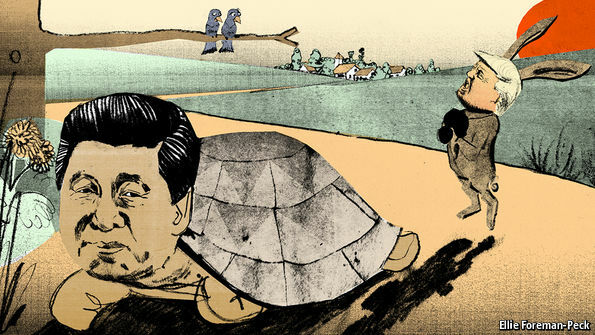 China, tortoise-like, is extending its head cautiously beyond its carapace, taking slow, painstaking steps. Aesop knew how this contest is likely to end. 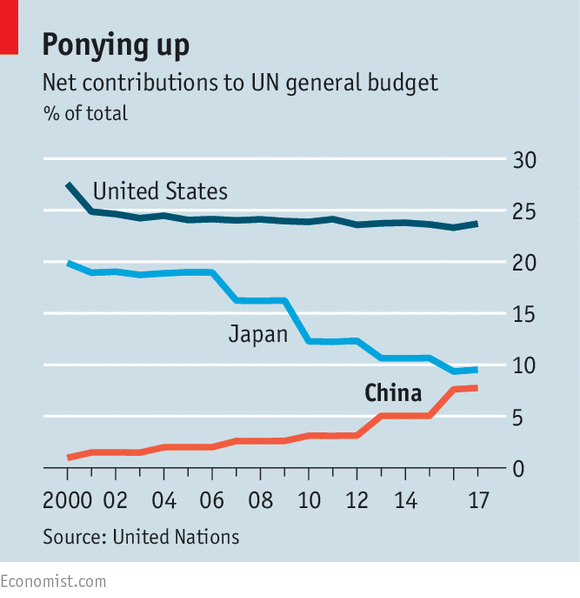 China’s guiding foreign-policy principle used to be Deng Xiaoping’s admonition in 1992 that the country should “keep a low profile, never take the lead…and make a difference.” This shifted a little in 2010 when officials started to say China should make a difference “actively”. 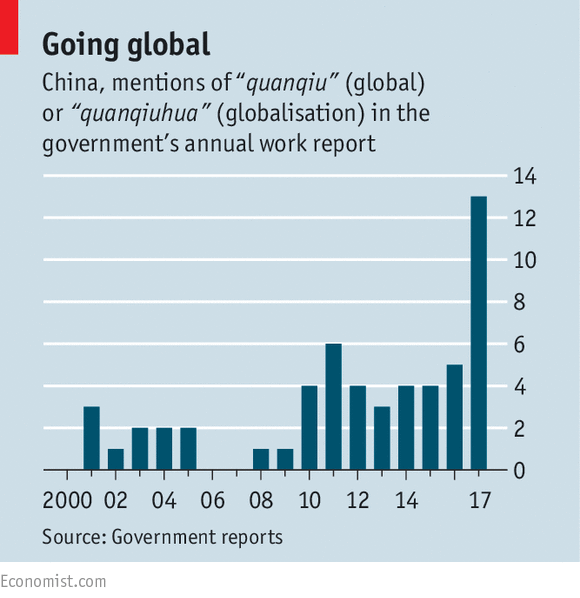 It shifted further in January when Mr Xi went to the World Economic Forum in Davos, Switzerland, and told the assembled throng that China should “guide economic globalisation”. Diplomats in Beijing swap rumours that a first draft of Mr Xi’s speech focused on the domestic economy, an uncontroversial subject that Chinese leaders usually like to talk about abroad. Mr Xi is said to have rejected this version, and brought in foreign consultants to write one dwelling more on China’s view of the world. Whether this story is true or not, the speech was strikingly international in tone and subject matter. To answer that, it is important to begin with the way China’s political system works. Policies rarely emerge fully formed in a presidential speech. Officials often prefer to send subtle signals about intended changes, in a way that gives the government room to retreat should the new approach fail. The signals are amplified by similar ones further down the system and fleshed out by controlled discussions in state-owned media. In the realm of foreign policy, all that is happening now. Soon after Mr Xi’s comments in Davos and Beijing, the prime minister, Li Keqiang, gave his annual “work report”—a sort of state-of-the-nation speech. It included an unusually long passage about foreign policy and mentioned quanqiu (meaning global) or quanqiuhua (globalisation) 13 times. That compares with only five such mentions last year (see chart). As is their wont, state-run media have distilled the new thinking into numerical mnemonics. They refer enthusiastically to Mr Xi’s remarks on globalisation and a new world order as the “two guides”. And they have begun to discuss the makings of an idea that, unlike the old one of a China model, the country would like to sell to others. This is the so-called “China solution”. The phrase was first mentioned last July, on the 95th anniversary of the founding of the Chinese Communist Party. Mr Xi’s celebratory speech asserted that the Chinese people were “fully confident that they can provide a China solution to humanity’s search for better social institutions”. The term has gone viral. Baidu, China’s most popular search engine, counts 22m usages of its Chinese rendering: Zhongguo fang’an. No one has defined what the China solution is. But, whatever it means, there is one for everything. Strengthening global government? There is a China solution to that, said the People’s Daily, the party’s main mouthpiece, in mid-March. Climate change? “The next step is for us to bring China’s own solution,” said Xie Zhenhua, the government’s special climate envoy, in another newspaper, Southern Metropolis. There is even a China solution to the problem of bolstering the rule of law, claimed an article in January in Study Times, a weekly for officials. Multi-billion-dollar investments in infrastructure in Central Asia are China’s solution to poverty and instability there. And so on. Unlike the China model, which its boosters said was aimed at developing countries, the China solution, says David Kelly of China Policy, a consultancy, is for everyone—including Western countries. I have been promising a review of Nicholas Eberstadt’s very important book, Men Without Work: America’s Invisible Crisis. The book is relatively short at 216 pages, but it is packed with meaty facts and insights. One of the reasons I seldom read an actual physical book anymore is because I can highlight text and make notes in my Kindle app on my iPad and then find those notes and highlighted sections on my Amazon page for later review. I actually highlighted 36 pages with 22,000 words from this book to go back and review. And while I will be using a lot of quotes in this letter, I hope this simply spurs you to order the book and read it for yourself. The “invisible crisis” that the author is writing about is at the very center of our economic and political turmoil. At its heart, the book is about the fact that there are some 10 million American men of prime working age (25 to 54) who have simply dropped out of the workforce, and the great majority of them have not only dropped out of the workforce, they have also dropped out from any commitments or responsibilities to society. It is not just the labor force they are not participating in; they are not participating in the normal ebb and flow of community life. This is not a recent phenomenon. I used the following graph last week, but it is important to illustrate the point. 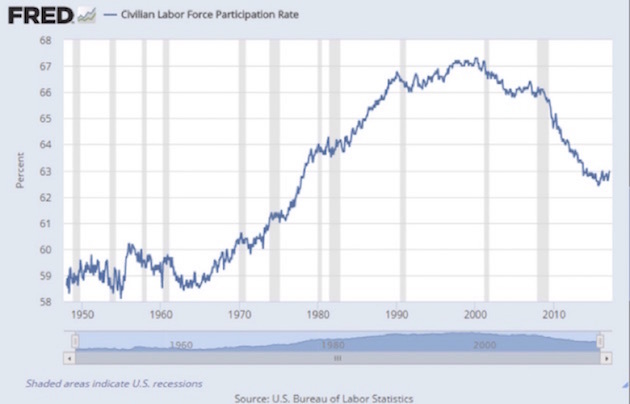 Male participation in the civilian labor force has been steadily dropping for 60 years, through boom and bust years, periods of inflation and deflation, Republican and Democratic administrations and congressional control; the trend seems to be relentless – except that it has been accelerating since 2009. The trend was in place long before automation began to really impact the manufacturing workforce or jobs began to shift to China and other countries with lower labor costs. AMERICAN workers without college degrees have suffered financially for decades – as has been known for decades. More recent is the discovery that their woes might be deadly. 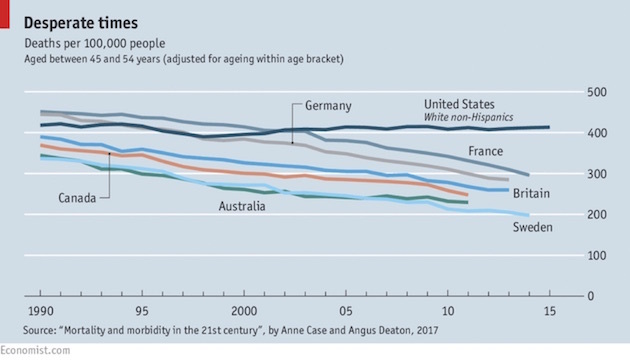 In 2015 Anne Case and Angus Deaton, two (married) scholars, reported that in the 20 years to 1998, the mortality rate of middle-aged white Americans fell by about 2% a year. But between 1999 and 2013, deaths rose. The reversal was all the more striking because, in Europe, overall middle-age mortality continued to fall at the same 2% pace. By 2013 middle-aged white Americans were dying at twice the rate of similarly aged Swedes of all races (see chart). Suicide, drug overdoses and alcohol abuse were to blame. You might think that rising mortality is the flipside of falling incomes. Recent trends in median per-person income for households headed by white 50- to 54-year-olds mirror their mortality rate. Income rises in the 1990s and then falls in the 2000s, ending up roughly where it started. But split people out by education, and the reflection fades. The income of college graduates has followed a similar pattern (most of the surge in the value of a college education happened before 1990). But their mortality has steadily fallen. And deaths of despair are much rarer among blacks and Hispanics, whose incomes have been on similar paths. Ms Case and Mr Deaton have now updated their work on these so-called “deaths of despair”. The results, presented this week at the Brookings Institution, a think-tank, are no happier. White middle-age mortality continued to rise in 2014 and 2015, contributing to a fall in life expectancy among the population as a whole. The trend transcends geography. It is found in almost every state, and in both cities and rural areas. The problem seems to be getting worse over time. Deaths from drugs, suicide and alcohol have risen in every five-year cohort of whites born since the 1940s. And in each group, ageing seems to have worse effects. The authors suspect more amorphous, long-term forces are at work. The fundamental cause is still a familiar tale of economic malaise: trade and technological progress have snuffed out opportunities for the low-skilled, especially in manufacturing. But social changes are also in play. As economic life has become less secure, low-skilled white men have tended towards unstable cohabiting relationships rather than marriages. They have abandoned traditional communal religion in favour of churches that emphasise personal identity. And they have become more likely to stop working, or looking for work, entirely. The breakdown of family, community and clear structures of life, in favour of individual choice, has liberated many but left others who fail blaming themselves and feeling helpless and desperate. Job destruction caused by technology is not a futuristic concern. It is something we have been living with for two generations. 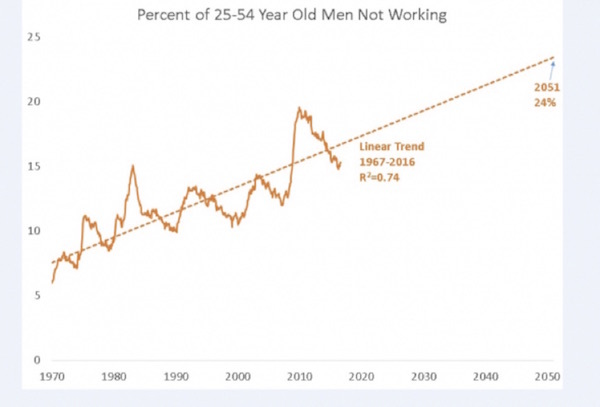 A simple linear trend suggests that by mid century about ¼ of men in the US aged between 25 and 54 will not be working at any moment. I think this is likely to be a substantial underestimate unless something is done for a number of reasons. First, everything we hear and see regarding technology suggests the rate of destruction will pick up. Think of the elimination of drivers, and those who work behind cash registers. Second, the gains in average education and health of the workforce over the last 50 years are unlikely to be repeated. Third, to the extent that non-work is contagious, it is likely to grow exponentially rather than at a linear rate. Fourth, declining marriage rates are likely to raise rates of labor force withdrawal given that non-work is much more common for unmarried than married men. On the basis of these factors I would expect that more than one third of all men in the US between 25 and 54 will be out of work at mid-century. Very likely more than half of men will experience at least a year of non-work out of every five. This would be in the range of the rate of non-work from high school dropouts and exceed the rate of non-work for African-Americans today. My only real quibble with this analysis is his suggestion that the gains in the health of the workforce over the last 50 years will not be repeated. The technology that I’ve been looking at lately (and much of it is not public) convinces me that younger generations are going to live a great deal longer than they now dream possible. By 2040 and certainly by 2050, expectations of a lifespan and a productive healthspan of over 100 years will be common. I am talking about a radical shift in the entire human aging process. Of course, this trend doesn’t address the emotional and sociological aspects that Summers, The Economist, and Nicholas Eberstadt are referring to. I’ve made this point over the years but it is worth repeating again. There are only two ways for an economy to grow. That’s it. If you don’t have these two elements you’re not going to have economic growth. One way is that the workforce increases, and the other is that you increase productivity. If Summers is right that 1/3 of working age males are essentially going to drop out of the workforce, then, when we couple that with Baby Boomers retiring in the coming decades (or at least slowing down somewhat – well, except for me and possibly you), we are simply not going to get the increase in GDP that normally comes from growth in the workforce. Further, it is really hard to increase productivity in much of the service sector. How much more productive can a bartender or a cashier be? Or a taxi driver? Yes, we can eliminate their jobs with technology, but that just reduces the workforce side of the equation. I know that many politicians indulge in the wishful thinking that we can somehow recover the economic nirvana that we enjoyed from the ’50s through the ’90s because both productivity and the workforce were growing. 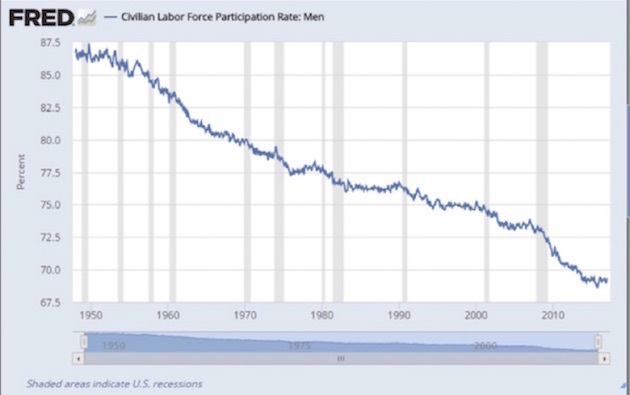 Even though the participation rate of males was falling, the participation of women in the workforce was rising far faster, so the overall workforce was increasing. This whole workforce issue, as I deal with the truly difficult challenge of researching and writing a chapter on the future of work for my upcoming book, is forcing me to rethink a great deal about how the economy is likely to behave and how successful investing will be conducted in the future. I cannot remind you strongly enough that past performance is not indicative of future results. I don’t see us turning the workforce situation around unless we somehow manage to transform our negative imagery about immigrants and start to aggressively seek out productive young, educated immigrants from around the world. I am not going to hold my breath on that one. The collapse of work for America’s men is arguably a crisis for our nation – but it is a largely invisible crisis. It is almost never discussed in the public square. Somehow, we as a nation have managed to ignore this problem for decades, even as it has steadily worsened. There is perhaps no other instance in the modern American experience of a social change of such consequence receiving so little consideration by concerned citizens, intellectuals, business leaders, and policymakers…. Note that elsewhere in the book Eberstadt adopts a somewhat softer stance in talking about the circumstances that are bringing about the reduction in labor participation, especially with regard to the some 20 million former felons who have been relegated to second-class workforce status. • “The Jobs Report Is Even Better Than It Looks” (November 2015, FiveThirtyEight) (He then goes on to list numerous other recent articles. All of these assessments draw upon data on labor market dynamics: job openings, new hires, “quit ratios,” unemployment filings and the like. And all those data are informative – as far as they go. But they miss also something, a big something: the deterioration of work rates for American men. Between 1948 and 2015, the work rate for U.S. men twenty and older fell from 85.8 percent to 68.2 percent. Thus the proportion of American men twenty and older without paid work more than doubled, from 14 percent to almost 32 percent. Granted, the work rate for adult men in 2015 was over a percentage point higher than 2010 (its all-time low). But purportedly “near full employment” conditions notwithstanding, the work rate for the twenty-plus male was more than a fifth lower in 2015 than in 1948. Before World War II, the exclusive economic activity for the overwhelming majority of U.S. women was unpaid labor at home. Today the overwhelming majority of women – including women with young children – engage in at least some remunerated employment outside the family. Needless to say, this shift has opened up new prospects for prosperity, as well as new horizons of economic independence and autonomy. The tremendous expansion of economic opportunities for U.S. women created a massive new supply of workers in the postwar economy. The share of women with paid work skyrocketed in every age group and doubled for women between twenty-five and sixty-four. For women twenty-five-to-fifty-four, the work rate was 34 percent in 1948; in 2015, it topped 70 percent. In arithmetic terms, this enormous influx of new workers completely offset the decline in work rates for prime-age men – and then some). Thanks to the progressive entry of ever-greater proportions of women into the workforce, overall work rates for every grouping of Americans between the ages of twenty and sixty-four also increased substantially between the late 1940s and the late 1990s. Around the late 1990s, however, the escalation of work rates for U.S. women stalled and, over the past decade and a half, fell from their all-time highs. Only then did the overall work rate for U.S. adults begin to register a decline…. Accordingly, more than eight times as many prime-age men were economically inactive and not pursuing education in 2014 than in 1965. One final aspect of the U.S. postwar male flight from work merits mention here: its relentless intergenerational momentum. It is not just that LFPRs (Labor Force Participation Rate) have deteriorated for certain age groups or specific periods. Rather, the process has progressively depressed every successive rising cohort’s LFPRs over the course of the prime working ages…. With rising incomes and attendant gains in personal wealth, older American men were no longer consigned to laboring until death. The convention of “retirement” arose well before the New Deal or Social Security. By 1930, Costa noted, over 40 percent of American men sixty-five and older were no longer working or looking for work – nearly twice the fraction in 1880. With prosperity rising, a small but growing fraction of men in their early sixties and late fifties also began to retire early…. And so the puzzle: America has a more robust economy, a more flexible and dynamic labor market, and a more limited welfare state than any of these six countries. But it has failed to keep its younger men in the workforce at the level that these struggling nations (with the arguable exception of Italy) have achieved. Why? Consider the annual hours worked and per capita output over the past generation in the G-7 countries (the world’s major affluent democratic societies: the United States, Japan, Germany, France, Britain, Italy, and Canada;). No G-7 economy today produces as much value added per citizen as the United States and none have a workforce where employees spend as much of the year on the job. Employed Canadians and Britons now work at least one hundred hours per year (over two full workweeks) less than working Yanks. The gap between the United States and France, according to the OECD, is now nearly three hundred hours (over eight full workweeks). More than four hundred annual hours (over ten full workweeks) separate workers in America and Germany…. Marital status and family structure/living arrangements likewise prove powerful predictors. Married men accounted for three-fifths of prime-age job holders but only about one-third of NILFs (Not in Labor Force). in 2015. On the other hand, men who have never married were underrepresented among the employed and overrepresented among NILFs. Finally, foreign-born men in 2015 were more likely to be job holders and decidedly less likely to be NILFs than the prime-age male population as a whole. In sum, an American man ages twenty-five-to-fifty-four was more likely to be an un-worker in 2015 if he (1) had no more than a high school diploma; (2) was not married and had no children or children who lived elsewhere; (3) was not an immigrant; or (4) was African American…. No matter their race or educational status, married men raising a family work more, and never-married men without children or children in their home work less. No matter their ethnicity or race, prime-age men who come to this country work more than those here by birth. Neither a wedding ring nor a green card confers innate advantage in the competition for jobs. Rather, marriage and migration decisions point to motivations, aspirations, priorities, values, and other intangibles that do so much to explain real-world human achievements. The legacy of prejudice might seem to explain why prime-age male work rates and workforce participation rates are lower for blacks than whites today. But they cannot explain why work rates and LFPRs for white men today are decidedly lower than they were for black men in 1965. And they surely cannot explain why prime-age male LFPRs today are higher for Latinos than non-Hispanic whites (see figure 5.1). Nor can they explain why labor participation rates of married black men twenty-five to fifty-four are higher than for never-married white men in that same age group (see figure 5.2). …. Released felons and ex-prisoners form a far larger fraction of the working-age male population than any other population group. These men with criminal records are disproportionately people of color and/or those with low educational attainment. Amazingly, however, the U.S. government does not today bother to collect information on their employment patterns. As we shall see, a single variable – having a criminal record – is a key missing piece in explaining why work rates and LFPRs have collapsed much more dramatically in America than other affluent Western societies over the past two generations. This single variable also helps explain why the collapse has been so much greater for American men than women and why it has been so much more dramatic for African American men and men with low educational attainment than for other prime-age men in the United States. After two decades, reported U.S. crime rates for all major types of crime finally declined. Crime rates in America today are thought to be more or less back to levels of the early 1960s. Incarceration rates, on the other hand, are roughly five times as high today as they were in the late 1960s. As a direct consequence of crime and punishment trends since the 1960s, American society now contains a truly vast, if generally invisible, army of noninstitutionalized felons and ex-prisoners. These are overwhelmingly adult men convicted of serious criminal offenses who have been punished with prison time or probation, but who are now part of our general population. Most well-informed readers know that the number of U.S. convicts behind bars has soared in America in recent decades and that the United States currently has a higher share of its populace in jail or prison than almost any other country. But only a tiny fraction of all Americans ever convicted of a felony are actually incarcerated at this moment. Maybe 90 percent of all sentenced felons today are out of confinement and living more or less among us. Eberstadt has written a brilliant book highlighting some painful problems. If I could, I would make it required reading for anyone holding public office above the level of dogcatcher. As I said, I highlighted some 36 pages in his book. This letter would have been a lot longer if I had used everything I wanted to. I guess you will just need to read the book for yourself. As we take Eberstadt’s data and absorb it into our economic models, we find that it doesn’t bode well for future growth. And growth is what we need to make our portfolios rise and shine. In two weeks I will be bringing you a letter in which I will talk about exactly how I would go about designing a portfolio for the coming decade. I think it is one of the most important letters that I will write for a long time to come. I just wanted to give you a heads-up so you can make sure to read it. This week I am hosting guests at my home for chili and conversation as we begin the launch of my new wealth management program. Those of you who are invited will shortly be getting the letter mentioned above, giving you full details. Then the week after I fly to Washington DC to be with my friends George and Meredith Friedman of Geopolitical Futures as they host their inaugural Geopolitical Futures Conference. I am not participating, other than as a geopolitical junkie wanting to hear what the excellent group of presenters have to tell us. I do have a few meetings arranged in the Swamp, so I will be busy. Then I fly to Atlanta, where I will meet Shane for an evening and have dinner with old friends Martin and Margie Truax. The following day we’ll drive to Augusta, where for the first time in my life I will spend Saturday and Sunday watching the professionals at the Masters and being hosted by good friends and members. Shane then flies back to Dallas, and I will go on to Tampa Bay to have dinner and spend the next d ay with Patrick Cox and some friends. We’ll be getting updates on two of the most promising and revolutionary antiaging biotechnology companies on the planet. I am sure Patrick will be reporting on what we hear. Even with my schedule, I’m still trying to get into the gym 4 to 5 times a week. Part of the key to being able to work for another 10 years is making sure that I stay in shape. Typically, during the week I do lower weights and higher reps. Except on Saturday, when my trainer and I have what we call “Beast It” days where we increase the weight and reduce the reps. This past Saturday we began to do bench presses and just kept adding the weight. I would do one or two reps and we would add another 10 pounds. One time in my 40s and one time in my 50s, I got to where I could bench 195 pounds, but I never quite got to 200 pounds. That last 5 pounds just wouldn’t go. For whatever reason, this last Saturday when we got to 200 I got it down and then all the way up. Patrick Cox and I have both been setting personal lifetime highs in a number of weightlifting categories. I surprised myself by doing 75 push-ups at one go here a few weeks ago. Not quite sure why that happened. I find that all very strange, as Patrick and I are both 67. Now, we are taking a lot of newer supplements and a few things that aren’t exactly on the market yet (ahem). I’m not sure that I could say that any one thing is making the difference. I’m certainly not working out any harder than I did in my 40s. It may partially be my diet, as Shane has me eating much healthier. But whatever the reason, I just hope I can keep it up. Of course I need to do more aerobics, etc. There just never seems to be enough time, but I try to get at least 45 minutes to an hour a day of aerobics in, too. I say all that not to impress you but to encourage you to start your own routine if you haven’t. It’s not too late. Just get started. Spend some time with Brother Iron and Sister Steel. Make them part of your family, and they will pay you dividends. By the way, it looks like we have finalized the speaker list for the Strategic Investment Conference. I am really pumped up about how great this year’s conference is going to be. It is clearly going to be our best conference ever. If you haven’t registered, you need to do so now, before the seats are all taken. OK, time to hit the send button. You have a great week. THIRD time lucky. In each of the past two years, the Federal Reserve has predicted multiple interest-rate rises, only to be thrown off-course by events. On March 15th the central bank raised its benchmark Federal Funds rate for the third time since the financial crisis, to a range of 0.75-1%. This was, if anything, ahead of its forecast, which it reaffirmed, that rates would rise three times in 2017. “Lift-off” is at last an apt metaphor for monetary policy. 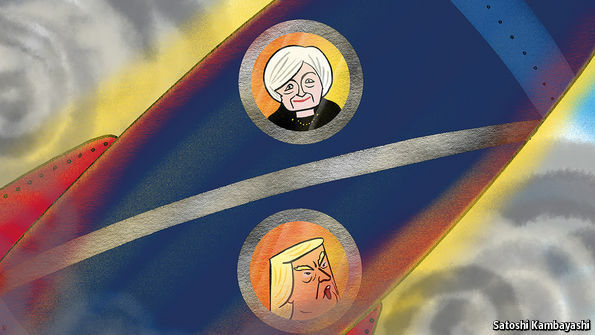 But as Janet Yellen, the Fed’s chairwoman, picks up speed in terms of policy, she must navigate a cloudy political outlook. The next year will define her legacy. Ms Yellen took office in February 2014 after dithering by the Obama administration over a choice between her and Larry Summers, a former treasury secretary. Left-wingers preferred Ms Yellen, in part because she seemed more likely to give jobs priority over stable prices. Indeed, Republicans in Congress worried that she would be too soft on inflation. The Economist called her the “first acknowledged dove” to lead the central bank. 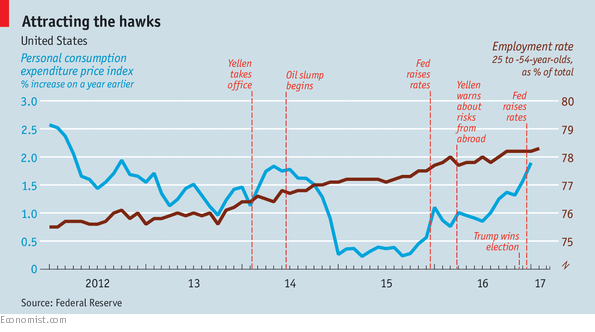 Today Ms Yellen looks more hawkish—certainly than Mr Summers, who regularly urges the Fed to keep rates low. Headline inflation has risen to 1.9% a year; but excluding volatile food and energy prices it is a bit stuck, at around 1.7%. Yet Ms Yellen has not really changed her plumage. As expected, she has consistently given high weight to unemployment. Before her appointment, when joblessness was high, she wanted the Fed to promise to keep rates low for longer than it then planned. Now that unemployment is just 4.7%, she is keener to raise rates than those who worry about stubbornly low inflation. In March 2015 Ms Yellen argued that, were the Fed to ignore a tight labour market, inflation would eventually overshoot its 2% target. The Fed might then need to raise rates sharply to bring it back down, risking a recession—and hence more unemployment. Better to lift rates in advance. Unemployment, however, was already down to 5.5%. So most rate-setters had started 2015 forecasting a rapid lift-off, taking rates up by at least one percentage point over the year. But inflation remained strangely tepid (see chart). 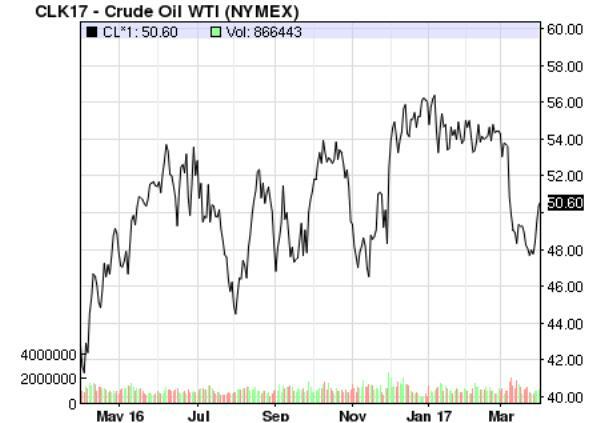 Cheap oil and a strong dollar were partly to blame. But wages also seemed stuck. Ms Yellen and her colleagues deduced that unemployment could safely fall a bit further. In the end, they raised rates once in 2015, in December. Again, they forecast four rate rises for the next year. This time they were delayed by worries over the global economy (China wobbled early in 2016). Officials also began to see lower rates as a permanent feature of the economy. Today, the setters think rates will eventually stabilise at 3%, down from a forecast of 4% when Ms Yellen took office. Ms Yellen’s Fed, then, has proved very willing to change course. And this time the Fed is speeding up, rather than postponing, rate rises. Three factors are at play. First, the global economy has been reflating since the middle of 2016. Second, financial markets are booming, boosting the economy by almost as much as three interest-rate cuts, by some estimates. Third, a fiscal stimulus is looming. 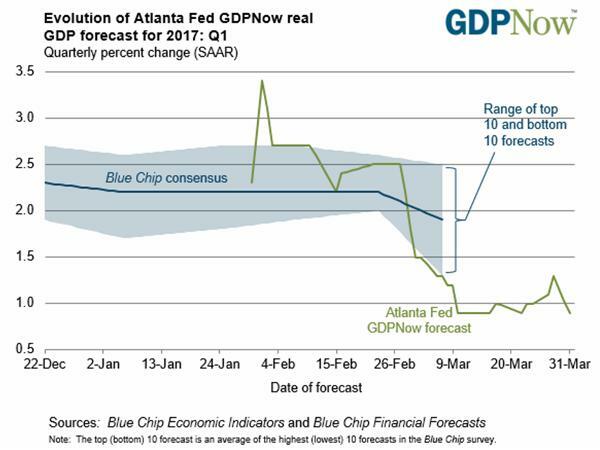 According to the Fed’s model, a tax cut worth 1% of GDP would push up interest rates by nearly half a percentage point. During his campaign Donald Trump promised cuts worth nearly 3% of GDP, according to the Tax Policy Centre, a think-tank. Doves insist that the Fed risks halting an incomplete recovery. Before the crisis of 2007-08, about 80% of 25-to 54-year-olds (the “prime age” population) had jobs. Today the proportion is 78%. The difference is about 2.5m potential workers, mostly not counted as unemployed because they are not looking for work. Were the Fed to aim for the nearly 82% prime-age employment seen in April 2000, the jobs shortfall would look twice as high. In October Ms Yellen wondered aloud whether a “high-pressure economy”, and a resulting wage boom, might coax more people to seek work. This led to reports—soon corrected—that she would let the economy overheat after all. In fact Ms Yellen has long warned that many drivers of labour-force participation are beyond the central bank’s control. A gentle pickup in wage growth since mid-2015 seems to support her view that unemployment is the best measure of economic slack. Rarely has unemployment been this low without inflation taking off. Once was in the late 1990s, when Alan Greenspan, a former Fed chairman, correctly predicted that rising productivity would stop a booming labour market from stoking inflation. Jeffrey Lacker, chairman of the Richmond Fed, recently offered another example. In 1965 unemployment fell to 4%, while inflation was only 1.5%. Yet prices took off in the years that followed: by 1968, inflation had reached 4.3%. That is what Ms Yellen wants to avoid. But the Fed has not often managed to tighten monetary policy without an ensuing recession. Should she manage it, her tenure will go down as a great success. That is, if she has time to finish the job. Her term ends in February 2018. If Mr Trump replaces her, she could stay on as a board member. But she would probably leave. So would Stanley Fischer, the Fed’s vice-chairman, whose term expires four months later. Two of the Fed’s seven seats are already vacant, and Daniel Tarullo, the de facto vice-chairman for regulation, goes in April. So Mr Trump may be able to appoint five governors, including the chairman, within 18 months of taking office. What then for monetary policy, and for Ms Yellen’s legacy? During his campaign, the president attacked the Fed for keeping rates low and said he would replace Ms Yellen with a Republican. Mooted successors include Glenn Hubbard, who advised George W. Bush; Kevin Warsh, a former banker and Fed governor; and John Taylor, an academic and author of a rule, named after him, for setting interest rates. All these potential successors are monetary-policy hawks. Some versions of the Taylor rule, for example, call for interest rates more than three times as high as today’s. Mr Trump, who promises revival and 3.5-4% economic growth, might not like the sound of that. If, like most populists, he wants to avoid tight money, he could appoint someone malleable to the Fed. But that would also be risky. One cause of the inflationary surge of the 1960s, notes Mr Lacker, was political pressure to keep policy loose even after ill-timed tax cuts. On one occasion, President Lyndon Johnson summoned the Fed chairman, William McChesney Martin, to berate him for raising interest rates (and to drive him around his ranch at breakneck speed). A simpler way to keep hawkish Republicans at bay would be to reappoint Ms Yellen. With Mr Tarullo out of the frame, Mr Trump would still be able to impose his deregulatory agenda, yet keep faith with Ms Yellen to set monetary policy. Senators would struggle to come up with reasons not to reappoint a central-bank chairwoman so close to achieving her goals. Bill Clinton and Barack Obama reappointed incumbent Republican chairmen. It might be in Mr Trump’s interest to reciprocate. For a while there it looked like the US and its main trading partners had finally achieved escape velocity. Growth was up, inflation was poking through the Fed’s 2% target, and most measures of consumer sentiment were bordering on euphoric. Long-term Treasury yields have declined modestly, while short-term yields have risen. A flattening of the Treasury yield curve in 2017 is a worrying sign for investors banking on resurgent U.S. inflation and growth. Long-term Treasury yields, which are largely driven by the U.S. economic and inflation outlook, have declined modestly this year, following a sharp rise in the wake of the November election of Donald Trump as president. The 10-year U.S. Treasury yield has fallen to 2.396% from 2.446% at the end of 2016. At the same time, short-term yields, which are more influenced by monetary policy, have risen in 2017 as Federal Reserve officials have made clear that they expect to continue raising the fed-funds rate through the rest of the year. As a result, the yield premium on the 10-year note relative to the two-year note—known in the market as the 2-10 spread—slipped Wednesday to 1.107 percentage points, its lowest level since the election. While the yield curve, like all market indicators, is subject to the ebb and flow of investor sentiment, economic data and political developments, a flattening yield curve gets special attention from investors world-wide because it can serve as an early signal of both economic slowing and overpricing in riskier asset clases. Those concerned that U.S. share prices were getting ahead of themselves took note in the first quarter when they “started to see the flattening of the yield curve,” said David Albrycht, president and CIO of Newfleet Asset Management, the fixed-income affiliate of Virtus Investment Partners . The Dow industrials have fallen 2% since hitting a record of 21115 on March 1. Though economic data in the first quarter were mixed, many investors believe the flattening of the curve is the result of the unwinding of “Trump trade” bets that inflation and growth would pick up imminently with the adoption of tax cuts and fiscal stimulus President Donald Trump has promised. Hopes of a so-called reflationary agenda have been set back by the defeat in Congress of a White House sponsored health-care bill. That raised questions about whether Mr. Trump can get other legislation through Congress. Expectations for higher long-term yields and a steeper curve rested on two pillars: first, that the economy on its own was showing signs of improvement, and second, that it would get an extra lift from promised tax cuts, infrastructure spending and regulatory relief. At the outset of the second quarter, both of those pillars are still standing, yet neither is looking as sturdy as before. The Journal goes on to note that the spreads between Treasuries and junk bonds are widening, which indicates growing fears of a slowdown-induced credit crunch. And that junk bond issuance is soaring, which implies a desire on the part of sub-investment-grade borrowers to raise cash while they can. 1) There never really was a recovery. The post-election pop was, as the Journal asserts, just the human nervous system responding to a “new and improved” US government the way grocery store shoppers instinctively reach for boxes that promise a better version of an old stand-by. Now that the novelty has worn off, the markets are experiencing a “same corn flakes, different box” let-down. In which case 1% – 2% growth might be the ceiling, and debt/GDP will continue to soar world-wide. Make no mistake, this is an epic worst-case scenario. 2) Oil spiked in 2016, which led many to conclude that the global economy was growing because it was demanding more energy. But then crude gave back most of its gains, extinguishing the previous optimism and causing economic indicators like consumer spending to stall (because we’re all paying a bit less for gas lately). So risk-off: sell stocks and junk bonds, buy Treasuries. 3) No one has the slightest idea what’s happening as insane levels of debt distort the models economists use to predict the future. From here on out, it’s unpleasant surprises all the way down. Time will tell, but door number 3 is an increasingly safe bet. A man in a long, black beard stops and spins around. "What did you say?" he screams in Turkish over the heads of the Hamburg police officers. His adversary leans over a metal barricade and screams again: "You dog!" Behind him, fellow protesters chant: "Murderer Erdogan! Murderer Erdogan!" They hold signs in the air reading "Hayir," or "No." The reference is to the upcoming April referendum in Turkey on proposed amendments to the country's constitution. The liberal Alevi Cultural Center, along with several other organizations, was behind the demonstration, called to protest the appearance of Turkish Foreign Minister Mevlüt Cavusoglu in Hamburg. In response, dozens of people gathered in the northern German city late last Tuesday afternoon to heckle supporters of Turkish President Recep Tayyip Erdogan. The bearded man is furious. "You are the dog," he screams towards the demonstrators. He then adds: "Are you Christians or what?!" His face is contorted in anger as though he has just uttered the worst curse he can imagine. When asked about it later, he says he doesn't have anything against Christians, but he does add that they are weak and don't have true faith. "Germany is going to the dogs. Should I let my children grow up in such a country? I can hardly bear the Islamophobia anymore." The man was born here and speaks perfect, accent-free German. "Yeah," he says, "we're not stupid. We understand everything that is going on here, including German hypocrisy. That's why we are going to emigrate to Turkey soon." He's standing next to a white metal fence at the entrance to the Turkish consulate-general's residence in Hamburg. People waving Turkish flags are streaming into the front yard of the elegant building on Alster Lake. Some have wrapped themselves in the banners or wound them around their heads. For the neighbors in this Hamburg neighborhood, it is a strange scene: on the one side are the demonstrators calling out "Erdogan! Dictator!" On the other are 300 supporters of the president chanting "Allahu akbar!" The evening's events exposed the deep divisions in Turkish society that have been created by the constitutional referendum campaign. President Erdogan is seeking to tighten his grip on power by making himself head of government in addition to his current role as head of state. But it is by no means clear that he will get his way. Which is why he is also doing all he can to secure the vote of Turkish citizens living overseas, thus making the conflict over Turkey's future into a German conflict as well -- one which is becoming a threat, and deepening rifts within German society as well. On the one hand, the Turkish community is perhaps more divided than it has ever been in the 50 years since Turks began coming to Germany as guest workers. On the other, German skepticism of their Turkish neighbors has grown of late. How is it possible, they wonder, that so many young people who grew up here venerate a man who is seeking to erode those democratic values of which Germans are so proud? Conversely, many of those with Turkish roots wonder why Germans still see them as Muslim aliens, even if they are cosmopolitan, successful and perfectly integrated. Why are the group's achievements so rarely highlighted? The conflict is a challenge for the chancellor as well. Many Germans are outraged by Erdogan's provocations and would like to see Angela Merkel stand up to him more decisively. They are concerned that the refugee deal with Ankara has made Merkel susceptible to blackmail and that she has no choice but to accept Erdogan's impertinence. All of that is toxic for societal cohesion. Around 3 million people with Turkish roots live in the country. If they have a problem, Germany does too. Every political tremor in Turkey triggers aftershocks in Berlin, Cologne and Stuttgart. When the Turkish military launches a putsch to topple Erdogan, tens of thousands of people in Germany likewise sit glued to their televisions out of concern for Turkey's future. When Erdogan has journalists, lawyers, teachers and scientists arrested, their relatives in Germany are consumed with worry. And when the German journalist Deniz Yücel, who also has a Turkish passport, is locked up as an alleged terrorist, his German and Turkish supporters drive through cities in Germany in protest convoys. What is German and what is Turkish? They have become inextricably bound. But tensions are rising. Last week, when a journalist from the influential weekly Die Zeit appeared at Cavusoglu's campaign appearance holding a sign reading "Free Deniz," Erdogan supporters attacked him with the flags they were wearing, knocking off his glasses. The atmosphere, particularly on the radical fringes of the two camps, is becoming more hostile to the point that German security officials have now become concerned that the conflict could erupt in violence in Germany as well. "The fault lines between the various camps in Turkey are mirrored in Germany," says Hans-Georg Maassen, head of Germany's domestic intelligence agency. There is, in short, a part of Germany that is deeply affected by Erdogan. Yahya Kilicaslan, 32, shows up to his interview with SPIEGEL in a white Porsche SUV. "In my eyes, Erdogan remains a successful politician," the businessman says in a café in the Old Town center of Esslingen, located just east of Stuttgart. "He didn't just talk; he did what he said he was going to do." Turkey, Kilicaslan says, needs political stability to flourish, which is why he is supporting the referendum. Kilicaslan's enthusiasm shows that the Turkish president isn't just supported by the rural population of Anatolia. The young man is a third-generation immigrant who got his high-school degree in Esslingen before completing a trainee program in banking. He's now in the real estate business. "I see my future in Germany and I feel connected to the people here," says Kilicaslan, who sees himself as being right-of-center politically. Regarding Erdogan's recent comments comparing today's Germany with the Third Reich, he says: "That's unacceptable." But, he adds, more important than the rhetoric is the fact that Turkey adheres to its international agreements, such as the deal made with Germany in 2016 designed to stem the flow of refugees to Europe. But what about human rights, the arrest of civil servants and journalists, and the detention of the German journalist Deniz Yücel? "I hope he gets a fair trial," Kilicaslan says. "But I have no sympathy for him at all. For me, he is a demagogue." Germans don't like to hear such sentiments, and neither do Turkish opponents of Erdogan's Justice and Development Party (AKP). Kilicaslan is aware of that. He is one of the few who has been willing to defend the Turkish president in the German media and has appeared on a widely viewed primetime talk show in addition to a national radio program. He says he does so because he wants to help explain how many Turkish-Germans think. He is frequently attacked for his views. In response, he posted a message on his Facebook page reading: "Yes to debate and critique! No to hate campaigns and violence!" There isn't much uniting those who bitterly oppose Erdogan with those who support him, but when it comes to hate for their adversaries, the similarities are difficult to ignore. Integration expert Caner Aver, of the Center for Turkish Studies and Integration Research at the University of Duisburg-Essen, sees another commonality uniting the parties to the conflict: "There is a collective malaise. Everybody recognizes that something is going fundamentally wrong at the moment." Though they disagree about the reasons. The conflict over the coming referendum has exposed the degree to which many Turks in Germany feel their pride has been hurt and that they are not respected. They feel that, as Muslims, they are constantly on the defensive. When Foreign Minister Cavusoglu appears before them in Hamburg and says, "nobody can sever the bond we have with you. We will always be there for you," he is appealing to deep emotions and strikes a nerve among his listeners. What German politician has ever approached them with such commitment? A survey conducted on behalf of the University of Münster last year found that 87 percent of German citizens with Turkish backgrounds feel closely bound to Germany. But more than half of the 1,200 respondents also said that they feel like second-class citizens because of their origins. According to the survey, 83 percent get angry when Muslims immediately fall under suspicion following a terror attack. But it's not just about feelings and emotions. Turkish Germans, after all, have been successful in Germany and have good reason to exhibit more confidence than they sometimes do. Many AKP supporters, though, have a different understanding of democracy -- despite their integration in Germany and lessons on politics and civics in school. If the majority of a population decides to place its faith in a single party and a single head of state, then other countries simply have to accept that, many believe. The lessons of German history -- the reflex most Germans have to think back to 1933 when hearing such arguments -- are not as deeply rooted among all of those with Turkish roots. They view the separation of powers as largely unnecessary because they believe that Erdogan's patriotism will lead him to act in Turkey's best interests. Plus, those in Germany who watch pro-government broadcasters from Turkey have difficulty separating the propaganda from reality. Because they live in Germany, they have little experience with the more ominous elements of Erdogan's rule. Neither are they inclined to place much blame on Erdogan's shoulders for the recent spate of terror attacks that have shaken Turkey, for the country's suddenly weak economy or for the ongoing conflict with the Kurdish minority in the southeast. Instead, they believe the fault lies with the Zionists, with the United States, with the Kurds and with Europe. They see accusations that the AKP is destroying press freedoms as a joke. On the contrary, they see the fact that no German media outlet has reported positively about Erdogan's referendum as proof that if anyone has a problem with freedom of opinion, it is Germany. "Many have the feeling there is a double standard," says integration expert Aver. Why, for example, was the Dutch right-wing populist Geert Wilders allowed to hold a speech in Dresden but when it comes time for a Turkish minister to campaign on behalf of the constitutional referendum, he suddenly can't find a venue? It is difficult for many Turks to believe in German democracy, Aver says, when they have the feeling that the freedom of assembly doesn't apply equally to all. There are a number of similar discrepancies. Why, for example, are Islamist terror suspects pursued to the fullest extent of the law yet followers of the Muslim cleric Fethullah Gülen, who has been accused of being behind the coup attempt in Turkey, are protected? And, if the Kurdish Workers' Party (PKK) is banned in Germany as a terrorist organization, why don't German authorities do more about extremist Kurds in the country? These are questions that the journalist Polat Karaburan wonders about as well. Two years ago, he founded the news website NEX24 and he and his team report on Turkey in German as an "independent, non-partisan media outlet," Karaburan says. He only agreed to answer questions from SPIEGEL in writing. "We only report on those things that you won't see elsewhere," he wrote, meaning positive news about Turkey and Erdogan. "The Turkish president calls for aid to combat hunger in Africa," reads one headline, for example. Many Turks celebrate NEX24 on social media platforms as the only "truly objective" media outlet. Kurds and liberal Turks are less enthusiastic. NEX24, they say, is merely a purveyor of fake news and is controlled by Ankara, they write in emails and on Facebook. Karaburan, for his part, wrote to SPIEGEL that his critics only say such things "because we also publish reports that are critical of the PKK." Recently, Karaburan received a frightening threat from someone who identified himself as Kurdish. The writer said he wanted to blow up Karaburan with a hand grenade and then "extinguish your burning body with my urine." German security officials are just as concerned about the PKK youth organization as they are about the ultranationalist Turkish group the Gray Wolves. The PKK group has posted calls for violent resistance on the internet. But in addition to those radical groups, Turkish clans and even Turkish motorcycle gangs are represented in Germany, a milieu with a high potential for violence. Domestic intelligence head Maassen has warned of a "significant, powerful threat potential," both among supporters of Erdogan and among their opponents. Security officials are worried about the possibility of a repeat of the street battles and riots that took place in 2014 between PKK supporters and Salafists in Germany during the battle for the Syrian city of Kobani. In March 2016, PKK supporters in Aschaffenburg attacked a demonstration of Turkish nationalists and then began throwing rocks at police. "The situation in Turkey is so explosive, it won't take much for things to escalate here," says one high-ranking intelligence official. "It seems clear that appearances by AKP politicians or Erdogan himself are likely to pour oil on the fire." Dilan Karacadag, a journalist with Kurdish roots whose family migrated to Germany two generations ago, is sitting at her computer in Frankfurt clicking through the layout of the next day's issue of the daily Yeni Özgür Politika. The paper is printed in both Turkish and in Kurdish -- and it doesn't offer its readers much in terms of good news. There are stories about oppression and violence against opposition activists in Turkey and about the conflict between Erdogan followers and Kurds in Germany. It is the only Kurdish newspaper in Germany and has long been accused of being close to the PKK. "I've never seen things as bad as they are now," Karacadag, 27, says. For the last two years, she says, Erdogan has been exploiting the conflict with the Kurds to launch aggressive attacks against the minority group as a way of solidifying support. "The result has been significant hatred." The Turkish community these days seems to be gripped by destructive emotions that are driving it apart: Kurds versus the Turks, progressives versus the conservatives, the extreme right versus the leftists. Since organizing a campaign against the referendum in Germany, Mürvet Öztürk has learned just how deep this hatred runs. Angry Turkish taxi drivers have accused her of being an "enemy of Turkey" and she was branded a criminal by a group in front of a mosque. But she nevertheless continued her campaign, spending a recent afternoon dropping in on Turkish greengrocers, barber shops, restaurants and telephone shops in the Wiesbaden city center. In her shoulder bag, she was carrying two stacks of brochures. On one stack, the word "Hayir" was on the cover, on the other, the German translation: "Nein." She says she doesn't want to leave the streets and event venues in Germany to pro-government Turkish politicians and to Erdogan fans. Instead, she hopes to start a conversation with the many voters who still haven't made up their minds and she wants to encourage those who are opposed to the constitutional amendments to cast their ballots in the Turkish Consulate on March 27. In some shops, Öztürk has an easy job of it. In one barber shop, three freshly shaved young men immediately identify themselves as opponents of Erdogan's constitutional reform plan and they pose with Öztürk while holding up the "Hayir" brochures. In a Turkish restaurant, the owner takes a pile of the brochures for his counter so he can hand them out to his Turkish guests. Most, though, are warier. One travel agency owner says that many of his customers are Erdogan supporters and that he has sought to stay out of the debate. The man behind the counter of a Turkish jewelry shop takes a similar tack, saying: "Business is priority No. 1." Plus, he plans to vote "yes" anyway, because he is certain that Erdogan won't abuse the power he is asking for. Öztürk, 44, is a representative in the Hesse state parliament who, despite being a member of the Green Party, does not belong to a political party group in the legislature. A few weeks ago, she joined forces with Turgut Yüksel, a Hesse state parliamentarian with the Social Democrats who also has Turkish roots, to launch a non-partisan "No" campaign. Since then, they have found more than 300 active supporters, collected donations and printed 80,000 flyers. She believes that between 60 and 70 percent of Turkish-Germans are opposed to Erdogan's grab for uncontrolled power. "The problem, though, is going to be that of getting them to actually take part in the referendum." Not surprisingly, their adversaries have been quick to react. The pro-Erdogan paper Sabah called on its readers to refuse to open their doors to the two "traitors." The effect of such propaganda has seeped deep into the daily lives of Turkish-Germans. Filiz Ilhan, a 41-year-old lawyer from Berlin, tells the story of a recent visit to a Turkish supermarket in the German capital. She noticed that conversation stopped as soon as she walked in because she wasn't wearing a headscarf. At check-out, the cashier made a demonstrative show of friendliness to the woman behind her, who was wearing a headscarf. Ilhan is a self-confident, thoughtful woman. With her left-leaning liberal worldview and turn-of-the-century apartment in the Wilmersdorf neighborhood, her Turkish roots seem like more of an afterthought. She and her legal partner focus on criminal law, Ilhan has two sons and she is involved in public life and politics. But she says that it has become more difficult. She says that she lives "in a silent country" because everyone now seems to have to carefully weigh their words to avoid being immediately categorized, judged and maligned. Because the pressure brought to bear by AKP supporters has become so great, she says, those who think differently are pulling back and going quiet. "We can hardly be heard anymore," she says. Everybody is becoming increasingly careful about who they speak with and what they talk about. The unease is reminiscent of that encountered in countries with widespread state surveillance. Ilhan laments that there is a lack of solidarity from German civil society, saying that she had expected more people to take part in demonstrations on behalf of imprisoned journalist Deniz Yücel. "It is a mistake to believe that Erdogan is merely a Turkish problem," she says. "It is something that now affects us all." Nevertheless, she is opposed to simply banning Turkish politicians from campaigning in Germany for Erdogan's proposed constitutional amendments, a position she shares with the German chancellor. Thus far, Merkel has been doing her best to keep a cool head in her interactions with the Turkish government. In response to Erdogan's Nazi accusations, she merely said: "You can't even seriously comment on such misplaced aspersions." Last year, German-Turkish relations suffered as a result of parliament's passage of a resolution on the genocide perpetrated against Armenians in the early 20th century. Turkey likewise complained about the perceived lack of sympathy following the putsch attempt last summer. Since then, the German government has been doing all it can to avoid providing Erdogan with further excuses to raise his profile by attacking Germany. Merkel is doing her best to solve all conflicts away from the public eye. That, though, is not to Erdogan's liking. He is aware that blasting away at Merkel is a useful strategy for winning over Turkish-German supporters -- which explains his eagerness to provoke reactions from Germany. Yücel, the correspondent from Die Welt, is still behind bars, despite Erdogan having given Merkel the impression during a personal meeting in early February that a solution to the case could be negotiated. But on March 3, the president doubled down, accusing the journalist of being a "German agent" and a "representative of PKK." Ankara has also accused Merkel's government of being responsible for preventing Turkish ministers from campaigning in Germany on behalf of the referendum. This despite the fact that both Merkel and Foreign Minister Sigmar Gabriel have spoken out in favor of allowing such events to proceed. The two of them would have welcomed it were at least one of the events allowed to go ahead. After campaign appearances were cancelled in Gaggenau and Cologne, Germany's Foreign Ministry even sought to intervene to ensure that Turkish Foreign Minister Cavusoglu's event in Hamburg would go ahead. When local officials revoked permission for the event ostensibly due to fire safety concerns, Gabriel's staff called Hamburg City Hall to ask if perhaps a different venue could be arranged for the Turkish foreign minister -- without success. The extent to which trust between Germany and Turkey has eroded could be seen at a breakfast meeting between the two foreign ministers last Wednesday in the Adlon Hotel in central Berlin. Cavusoglu told Gabriel that he was convinced that Berlin had, in concert with the secret service and municipal governments, prevented the events. Gabriel was unable to convince his counterpart of the contrary. Still, the Turkish government has now submitted to Berlin a list of upcoming campaign events. It remains unclear, however, whether Erdogan is planning a personal visit to Germany prior to the vote. His name doesn't appear on the list, but the German Foreign Ministry is convinced that the Turkish president will make an appearance. Around 1.4 million Turks in Germany have the right to vote in the referendum, and polling stations will be opened at 13 different sites across the country between March 27 and April 9. Turkish law does not allow for voting by absentee mail ballots. In 2015 parliamentary elections, around 60 percent of voters in Germany supported the AKP, but there are no surveys to indicate how Erdogan's popularity has evolved since then. At the same time, Germany must address a further diplomatically sensitive issue: the climbing number of asylum applications being submitted by Turks. The Federal Office for Migration and Refugees (BAMF) has not been moving quickly to approve these applications, with a waiting period of around 16 months. But at some point, the agency will have to resolve the cases filed in the aftermath of last July's attempted overthrow. Should they be approved, the Erdogan government won't be happy. Indeed, Ankara has demanded that Germany extradite alleged followers of cleric Fethullah Gülen, whom Erdogan blames for the failed putsch. Many of the asylum applications likely have a good chance of approval. In a confidential report regarding the "situation in Turkey from the perspective of asylum and extradition" compiled at the end of February, the German Foreign Ministry painted a rather dark picture. "There are significant current indicators of systematic oppression against presumed Gülen movement followers without the existence of criteria for what signifies a 'follower,'" reads the report, which is a significant basis for decisions made at BAMF. Since the coup attempt, more than 500 Turks have been applying for asylum in Germany each month, including diplomats and soldiers. Just last week, the German Interior Ministry reported that four additional high-ranking military officers with diplomatic status had applied for asylum. Foreign Minister Gabriel has been doing his best to tip-toe around the looming conflict. He noted that even during the 1980s military dictatorship, Turkey was allowed to remain a member of NATO. Turkish economic interests and European security interests, he added, are significant enough to warrant caution when it comes to tensions in the relationship. But the question remains as to whether trust between Erdogan and Merkel has already eroded too far. The two didn't like each other from the very beginning. A Turkish government official says that Erdogan still hasn't forgotten Merkel's vocal opposition to Turkish EU membership, even before she was elected chancellor. Many Turks saw the failed EU membership application as rejection, as a collective slight of an entire people. Such emotions are now playing into Erdogan's hands. Many integration experts believe that Merkel's approach is fundamentally the correct one. Erdogan likes to play the victim role, says Ahmet Toprak, dean at the University of Applied Sciences and Arts in Dortmund, adding that one should avoid encouraging him. But for the domestic climate in Germany, Toprak says, it is important -- with the chancellor's help -- to overcome the "us vs. them approach." Detlef Pollack, a sociology of religion professor at the University of Münster, agrees. "The greatest achievement of civil society is that people get along even if they hold diametrically opposing views," he says. That, he continues, isn't so easy for some Turks because they never learned how to deal with self-criticism and diversity. Pollack nevertheless believes that majority German society, because it is in a position of strength, must take a step toward the Turkish community. "Of course you should be allowed to criticize, but you should also exhibit a certain amount of understanding and empathy when it comes to their strong connection to Turkey." Back in Hamburg last Tuesday, Turkish Foreign Minister Mevlüt Cavusoglu steps into his sedan following his appearance, leaving his cheering supporters behind. Three young men stick around in the cold, continuing to talk in front of the consulate general's residence. "It isn't fair how we are being treated by the Germans," one of them says. "If you support Erdogan, you don't have a chance anymore of being accepted." His friend agrees, saying he used to get along well with his German coworkers. But that is no longer the case. "Nobody wants to go to lunch with a Turk who votes for Erdogan."